[*For the initial application for accreditation, NADD is waiving the requirement that ten (10%) percent of the clinical staff of the program be NADD Certified Clinicians, Specialists, and Direct Support, however, depending on the Programs length of Accreditation (one, two or three years respectively) the Certification requirement is set at 10% of Clinical, Specialists and Direct Support Staff. Organizations/programs seeking accreditation begin the process by submitting an application (see Appendix A) together with an application fee of $500.00 to the NADD office. The application provides basic information about the organization/program including contact information, number of individuals served, number of individuals with a dual diagnosis served, the age level of those individuals with a dual diagnosis who are served, the types of services offered, and number of clinical and direct care staff who provide services to individuals with a dual diagnosis. Once received, the application is reviewed in the NADD office to confirm that this is an appropriate request for review and consideration for a NADD accreditation, and to estimate the amount of surveyor time that will be required to complete the review. Provided that the program meets requirements to seek accreditation, a survey will be scheduled. There Accreditation Survey includes: (1) interviews, (2) records review, and (3) policy and procedure review. The NADD surveyor(s) will have face to face interviews with treatment team members, other staff involved in treatment of the individual, and program administrators. The NADD surveyors will complete a records review and interview of the treatment team members on specific cases to ensure clear documentation that reflects the individualized goals of treatment plan as well as direct observation of the staff and persons receiving services. The NADD surveyor(s) will review and assess whether the policies, procedures, and practices reflect the best practice as established by the NADD certification. Upon completion of the accreditation survey, the surveyor(s) will meet with management of the program for a consultation/exit conference in order to provide feedback regarding the strengths of the program, as well as to identify areas for improvement, and to offer suggestions and consultation. After completion of the accreditation survey, NADD will make a determination about granting accreditation. The decision may be to grant accreditation for three years, two years, one year (provisional accreditation), or to deny accreditation. Programs which receive accreditation or provisional accreditation will receive a certificate. Three Years - A 3 year is awarded to Programs that meet or exceed the NADD accreditation standards for support for people with Dual Diagnosis (IDD/MI) and additionally demonstrate that they meet or exceed standards in the critical module areas, if appropriate to the program being surveyed, including; (1) Medication Evaluation, (2) Holistic and Individualized approaches, (3) Protocols for Diagnosis, (4) Treatment Planning, (5) Crisis Management and (6) Evidenced Based Treatment Practices. Two Year Accreditation - A 2 year Accreditation is awarded to Programs that meet the NADD accreditation standards for support for people with Dual Diagnosis (IDD/MI). To receive a 2 year accreditation, the Program must demonstrate substantial compliance with Best Practice standards. 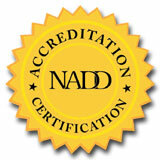 One Year / Provisional - 1 year certification is awarded to programs who score below NADD accreditation standards. Non Accreditation - A Program will not receive NADD Accreditation if the mission, values, treatment and services of the Program directly interferes with the health, safety, welfare and rights of the individual being served. In line with the NADD Accreditation Program's commitment to ongoing and continual improvement of services to individuals with a dual diagnosis, after receipt of the accreditation decision the program is expected to submit a Quality Improvement Plan identifying what steps it has or will take to improve any weaknesses identified in the survey. The Quality Improvement Plan should be submitted by the program within 45 days of receipt of accreditation decision and written report.